Note to all members; wreath’s will be placed at all of the following events unless otherwise indicated e.g.104 Squadron Pass out Parade, this event will not require the placing of a wreath, all other events will require a wreath this will be carried out by an executive or a nominated member. Wednesday 25 April 2013, Form up under the XRAAF Banner Medals NOT miniatures, march direction for ANZAC Day and Procedures please follow the link. Well members ANZAC Day 2013 was an absolute success as usual thanks to all the organisations involved just to mention a few, our Mayor Hon Bob Manning and Cairns City Council the Australian Defence Force, RSL Branches, Australian Defence Force Cadets, Police and Fire Rescue Services, the local bands, and of cause our return service members from all Thither’s of war, and war like operations Past and present in emergency and Peace. our local business our federal and local members, last but not least the supporting public, the list is endless our colleges and schools along with the clergy. I expect we all appreciate the wonderful people of our community and the hard work that goes into an event like this, well our special thanks to you all if we have forgotten to mention you please do not take offence as I have mentioned previously the list is endless. Anzac Day – Dawn Service Cairns Qld Australia 2013, click on the link below. 02 June 2013 a wreath will be placed at the Cairns Esplanade Cenotaph on the day similarly the same will be taken place Australia wide at our state capitals and territories, also abroad London Canada and New Zealand to honour, to pay tribute and to recognise the sacrifice of aircrew and ground crew during WW II, Followed by a Lunch or Dinner this will take place depending on a discussion by all members at the May 2013 meeting. Sunday 18 August 2013, Details: Memorial Service will be held on the Cairns Esplanade from 1700 HRS at the Cenotaph opposite the Cairns RSL Club, a wreath will be placed on behalf of the RAAFA Cairns Branch by our Vice President Mr William Maconachie. Sunday 11 August 2013, Casual Dress or RAAFA T/Shirt Rocky Creek Service Commences 11:00 HRS. Our Vice President Mr William Maconachie will represent our branch at this event and the placing of a wreath. Commemoration – 15 September Luncheon the following will take place. Battle of Brittan Day; 15 September 2013, followed by a luncheon Cairns RSL, please be aware that this event coincides with our September monthly meeting. Please NOTE members this meeting is not at the end of the month it is on 15th SEPTEMBER 2013. Next meeting: (Third Sunday) 15 September 2013, RSL Dress; as required or RAAFA T/Shirt, 10:30 HRS For Wreath Placing, General Meeting at 11:00 HRS. Followed by Battle of Britain and Battle for Australia Commemorative Luncheon. 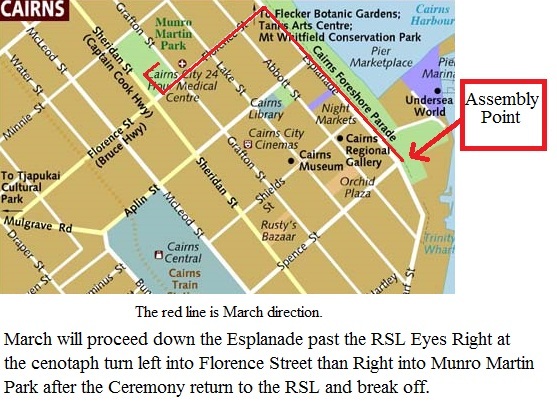 Monday 11 November 2013, Dress Casual with Medals Form up in front of the Cenotaph Esplanade well before 11:00 HRS. Followed by a Lunch or Dinner this will take place Either before or on the day depending on a discussion by all members at the September 2013 meeting for more on the click on the link. Australian Air Force Cadets 104 Squadron City of Cairns Pass Out Parade Date and Time. 23 November 2013, 1800 – 1900 HRS. if you plan on attending please contact the CO or the Orderly Room Clerk at the Squadron at least three weeks in advance seating is crucial, also please remember to pin on your medals. Contact No: Friday Nights only: 0740359363 between 1930 – 2030 HRS, during week days leave a message, and contact details. Note to all members please check this site if you were not present at a monthly meeting prior to an official event for any changes to the time and venue. PS as a reminder please confirm your attendance with one of the branch executives 24 hrs. prior to the event if a luncheon or dinner is planed for catering and seating arrangements. With all official events medals should be worn ONCE again it is up to the individual.